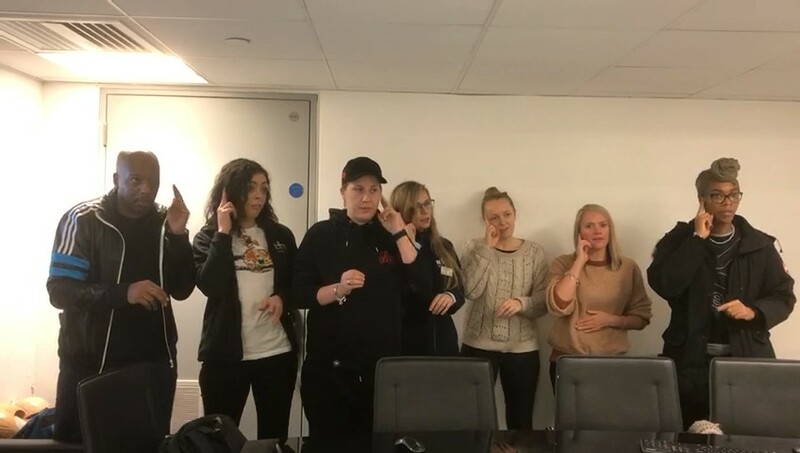 On Saturday Kathleen and an interpreter travelled to St Pancras Leisure Centre in North London to teach a group of swimming instructors BSL. The session started with Deaf Awareness – the importance of ensuring eye contact and keeping communication clear, to the point and visual. The instructors had given us a long list of phrases they wanted to learn such as “Face in water,” “Copy me,” “Line up on the side,” Glide on your back.” They enjoyed learning to sign because it was all relevant to their jobs. We hope more Deaf children and adults will be encouraged to learn to swim and will find classes more accessible, and that we can do similar training sessions at other sports centres. To find out more about Deaf Awareness and BSL training contact us.